April's Little Family: "Baby Wearing Fools" by Mama Seuss. "Baby Wearing Fools" by Mama Seuss. Wear you, wear you, will my spouse. In a sling or by my hip. At a party, in the kitchen. I will wear you everywhere. Daddy wears you on his back. Standing up, or when I sit. 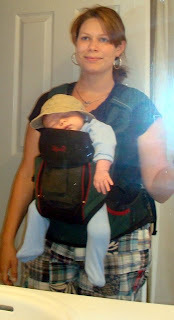 Posted in consideration of National Babywearing Week! 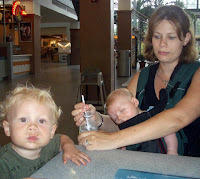 Check out other babywearers and babywearing fashions at this post and at Nonny & Boo. Lol! You need to send this to the people at Motrin! I'll never again be late. Ya'll I totally tried to cheat and be first here as April as I were chatting when she posted it but Ali beat me to the punch!!! Great post, one of my very favorites! We could never get the hang of that thing. We just picked the boy up. We were snugli-challenged. Look who is bustin' the ryhmes! This is great! Me likey lotsy! I love that you use "bitchin" in a seussesque rhyme. Love it! About as cute as your little ones! Love it! I wore both my babies, too, but in a suti, which is just a big square of cloth folded in half diagonally and then tied over the shoulder. It`s the traditional way to carry a baby here in Guatemala and very versatile (more so than a snugli!). 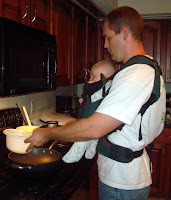 I didn`t even have a proper carrier until the second baby was about 4 months old, but I still prefer the suti because I can just swing him around onto my hip or back or shuffle him around to have him lie down to sleep. Nice and easy! Awesome! I love the rhyme and the pics! You are one hot baby-wearin' mama! Very cute...love the pics and rhyme! I loved wearing my baby...and then she got too heavy. I thought my hips here going to fall off. I miss it though. I've reached my 300 limit for entrecard drops today, but wanted to let you know I dropped by. @ ali: haha, i have a feeling they're a little overwhelmed right now. @ stiletto: maybe next time :-) thanks for the rhyme, i feel so special! @ heinous: my kids freaking LIVED in it. saved my sanity. @ felicia: that would be me in the hizzouse. LOL! @ expat: i have a few different carriers, for some reason the snugli got all the camera time?! @ linda: thank you thank you! That is awesome! I also love the bitchin' part. Priceless and great pix too. 2, [url=http://www.rcenter.net/]Cheap Sumatriptan[/url] - Order Imitrex - imitrex without rx http://www.rcenter.net/ .